Like all other stars the Sun was surrounded by a disc of debris which was made up of hydrogen and helium gas and, most importantly from the point of view of life, dust grains containing the higher elements produced in previous generations of stars - many of them supernova, including the one that caused the compression shock wave. The disc is called the protosolar disc. Since it now seems that all stars are accompanied by such discs the usual term is protoplanetary disc. This is shown in the accompanying artists diagram by Pat Rawlings (courtesy of NASA). Thus the carbon, oxygen, nitrogen, phosphorus, sulphur, chlorine, sodium, potassium, magnesium, calcium, iron and many trace elements were used in that wonderful chemistry we call LIFE. All the elements found in living organisms, with the exception of hydrogen which was produced seconds after the BIG BANG, were produced in massive stars. Thus we can say that we are all made of stardust. The formation of the planets took place within the protosolar disc. Under gravity the dust particles coagulated and formed pebbles then stones then boulders then mountains and the tiny planets we call planetisimals. Finally five planets orbited the Sun in the inner Solar System. They were Mercury, Venus, the Proto-earth, a planet about the size of Mars, which we shall call Orpheus, and Mars itself. The orbits of the proto-Earth and Orpheus were close and finally 20-40 years after their formation the two planets collided to form a somewhat enlarged Earth and a shower of debris which coagulated to form the Moon. It is probable that Mercury and Venus also underwent collisions. After their formation Mercury and the Moon were too small to hold an atmosphere or oceans of water. The Earth and very likely Venus and Mars became enveloped in oceans and gaseous atmospheres. Exactly how life began on Earth is not yet clear although a great deal of work is being carried out on the newly developing science of astrobiology. There is isotopic evidence from the ratio of deuterium to hydrogen that there was very likely considerable amounts of water. When the temperature of the oceans reached a tipping point, the hydrosphere underwent a run-away greenhouse resulting in the oceans boiling and a rapid development to the hostile conditions which exist to-day. The planet is now surrounded by an ocean of carbon dioxide with a pressure of over 90 atmospheres with the temperature of around 480 degrees Celsius on the rocks. The other possible scenario is that the temperature of the atmosphere was always too high to ever allow water to condense and that the combined greenhouse effect of steam and carbon dioxide ensured that the planet rapidly reached the kind of conditions which exist to-day, without passing through an 'ocean stage'. Whichever theory is true it does not alter the fact that, although Venus and Earth may have passed through very similar early histories, they are now as different as any two worlds could be. To-day Earth's twin planet, that shines like a beautiful jewel as the 'morning star' or 'the evening star', is the nearest place to hell in the Solar System. The clouds that hid the surface for so long are composed of concentrated sulphuric acid. Beneath the upper layers there is a hue of droplets of liquid or solid sulphur, sulphur dioxide and hydrogen sulphide. About 30 kilometres above the surface the atmosphere is surprisingly clear and the sinister orange light that penetrates through the clouds is remarkably brilliant. At the surface a suffocating atmosphere which is composed mostly of carbon dioxide with minor mounts of nitrogen bears down on the rocks at a pressure of almost a hundred atmospheres. Just like the pressure, the temperature varies with altitude but in th lowlands it is close to 480 degrees Celsius which is more than enough to melt lead. Gently rolling upland plains cover about 65% of the surface of Venus. About 20% of Venus is covered by extremely flat plains and are comparable to lowland regions. The highland regions are known as Terra and cover only 10% of Venus. There are only two major highland regions that rise high above the lowland regions. They are called Ishtar Terra and Aphrodite Terra. The highest mountain on Venus rises above the Ishtar Terra and is the only place on the planet to have a masculine name. It is the Maxwell Mountain after the famous scientist James Clerk Maxwell. Those who hope that it may one day be possible to terraform Venus will be sadly disappointed to learn that it has lost almost all its water. In the upper atmosphere of Venus and the Earth solar radiation splits water molecules into hydrogen and oxygen by a process called photolysis. The high gravitational fields of Venus and Earth hold on to all gases except hydrogen and perhaps helium almost indefinitely. Hydrogen however evaporates into space. However not only hydrogen but oxygen will also evaporate into space by another process - Earth is protected by a strong magnetosphere but Venus is not and oxygen as O+ ions is lost by being forced out by the solar wind. Much work is being carried out on studies of the atmosphere by the European space Agency's orbiting satellite 'The Venus Express'. On Earth almost all the water is in the liquid phase but on Venus there is little doubt, that although it should have started with about the same mount of water as Earth, it has lost most of it by the direct evaporation of the hydrogen component into space and the loss of much oxygen as O+ ions by scouring by the solar wind. 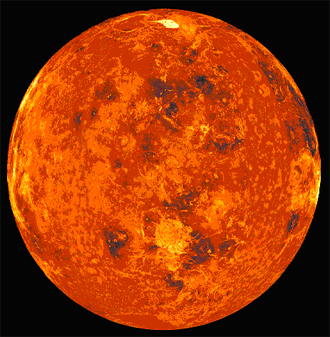 The amount of carbon dioxide on both Venus and the Earth is of the same order but on Earth it is mostly bound in the carbonate rocks or dissolved in the waters of the planet's hydrosphere whereas on Venus it is all present as a gas (strictly speaking a superfluid) at a very high pressure. It is a sobering thought that had Venus been just a little further out from the Sun or had the Sun been just a little less hot it may well have been a second Earth. Even more sobering is the fact that had Earth been just a little nearer the Sun or had the Sun been just a little hotter it would have been a second Venus and we would not he here. The illustrations above were obtained by radar surveys and are are taken from the European Space Agency's gallery and from NASA the author is very grateful of the help given by these organisations. The top left shows the Venus Globe. The middle right shows a high mountain Maat Mons and the bottom left shows an area of three craters. In earlier times, Mars is believed to have had an atmosphere of carbon dioxide dense enough to produce a greenhouse effect high enough to allow liquid water to exist on the surface and it appears that the low lands in the northern hemisphere are the remains of an ocean. Today it is a cold and arid desert. However there is still plenty of water on Mars in the form of ice which sublimes directly to water vapour since the atmospheric pressure is too low to allow water to exist in the liquid state. An interesting book entitled 'The Snows of Olympus ' was written by Arthur C Clarke in which he described how it may be possible in the future to produce Earth-like conditions on Mars - a process described as TERRAFORMING. The illustration of the twin peaks taken by the Mars Pathfinder in 1997 gives some idea of the lonely red wilderness of Mars. It is on the right hand side ot the page. We now know that, if life exists in the sulphuric acid clouds of Venus, under the soil of Mars or in the oceans that lie beneath the ice of Europa, Ganymede, Callisto or Titan, it will be very primitive. The moons of Jupiter Europa, Ganymede and Callisto and Titan the large moon of Saturn may have primitive life beneath surface. To find another wonderful biosphere like that on Earth we must look beyond the Empire of the Sun to planets orbiting other stars separated from us by the vast distances of interstellar space.